I have great mews up my fur-lined sleeve. Recently I found another favorite post-shopping café in Paris. The jumping joint is affordable and historic, too. Can you hear me now? Let’s go! 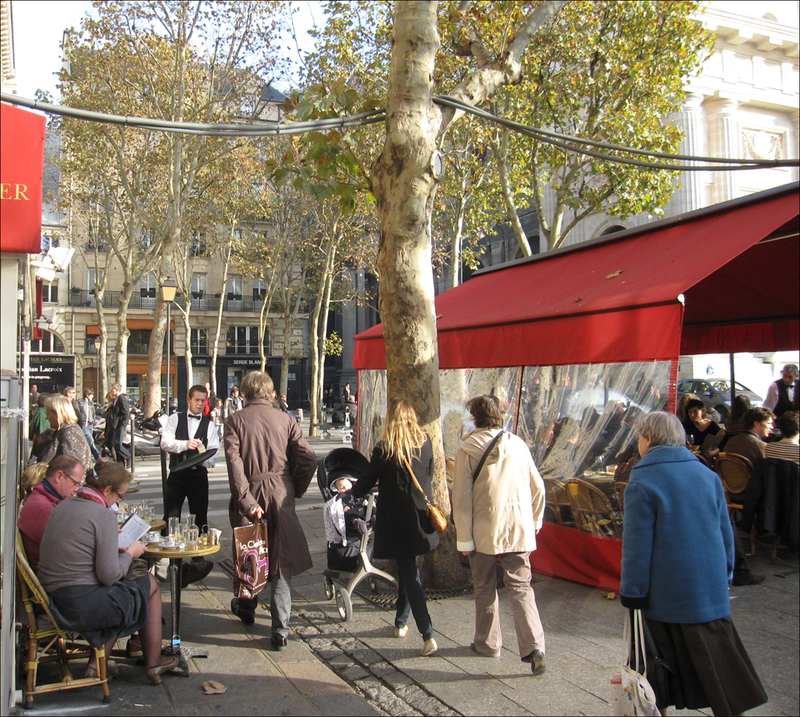 Conveniently located in Saint-Germain, kitty-corner to Église Saint-Sulpice, the Café de la Mairie is where I now rest my dogs (feet) during whirlwind bargain shopping sprees along rue de Rennes or in Saint-Germain-des-Près. Thank my sister Wendy for this discovery. During her recent jaunt to Paris, she’s the one who wisely suggested that we take a much-needed break at the café, and I’m happy to report that the experience was a delectable knockout win-grin. 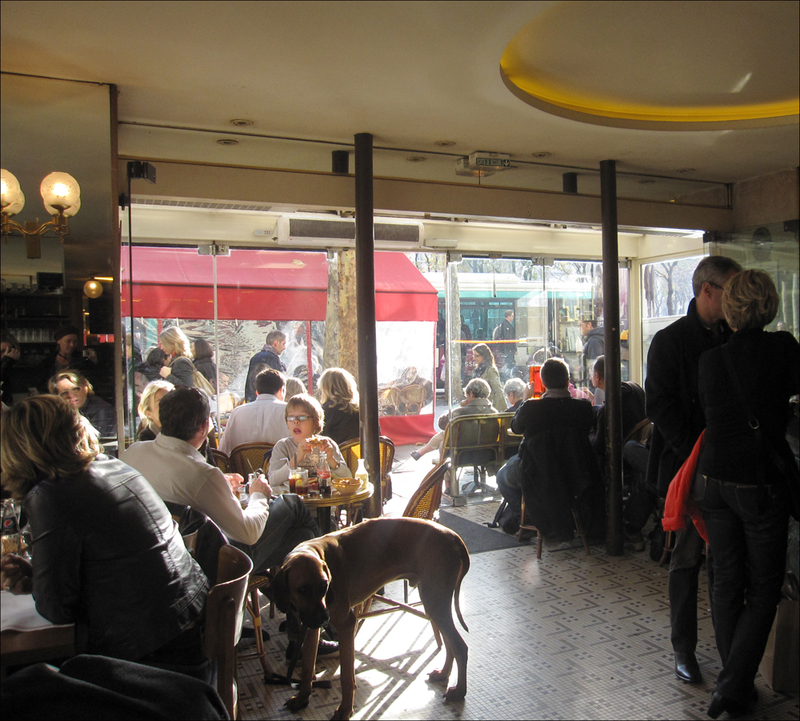 With both indoor and outdoor seating, the Café de la Mairie rocks a New York coffee shop or Baltimore diner vibe. Big dogs and loud chit-chat abound! It smells great, too. 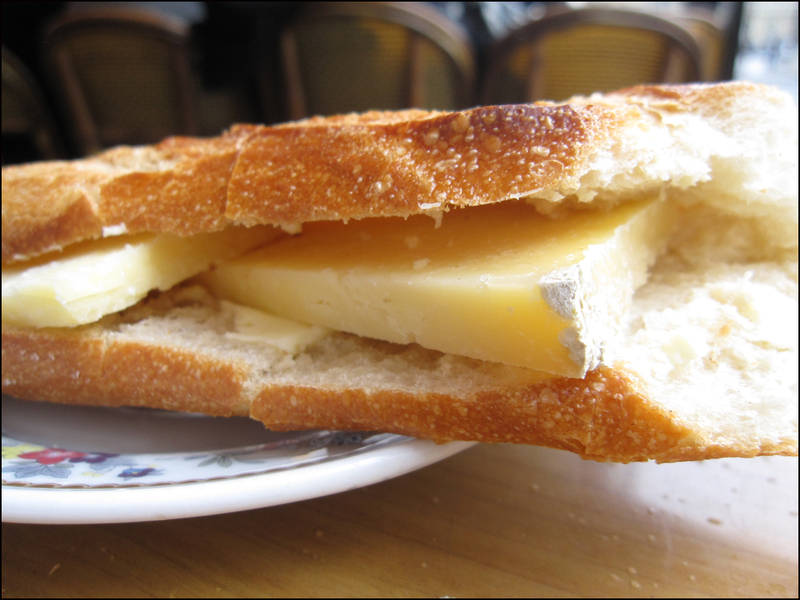 I recommend trying a Cantal cheese (which can be difficult to find outside of France) and butter baguette. This substantial sandwich costs €4, and is large enough for two. Just slice it down the middle! Don’t scrape off the mold. Savor each bite. The coffee is always rich and hot, topped with a thick layer of foam, and the bottled soda pops are served up all old-school with ice, a spoon and a slice of lemon. And the service? It’s consistently swift and friendly. Ask for Jeff. He’s a charmer. Who else has found inspiration here? Literary greats like F. Scott Fitzgerald, Ernest Hemingway and Albert Camus, that’s who, along with Anaïs Nin, Henry Miller, and Saul Bellow. Let’s also add Jean-Paul Sartre, Simone de Beauvoir, and Samuel Becket—just to name a few. 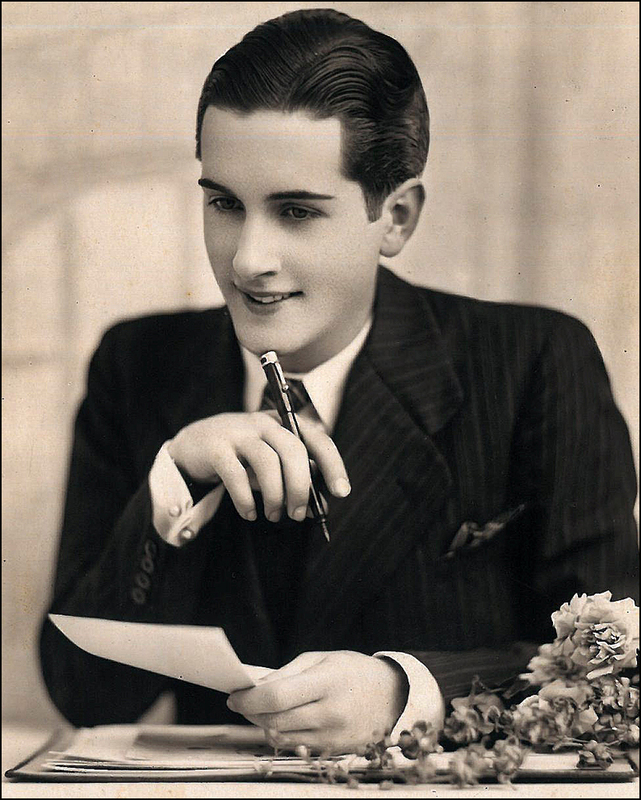 Tip: Pack a notebook and a ball point pen. Perhaps your muse will make a cameo appearance! Hello, best seller. Calling all DaVinci-Coders! For the love of Dan Brown, don’t leave without walking the famous Rose Line (which cuts right through the altar). While you’re at it, why not hang with its Delacroix’s inside, too. Added bonus: After fifteen years of restoration work, the church of Saint-Sulpice across the square recently shed its scaffolding, and the view is once more a beauty. It’s almost midnight but looking at the first picture is making me hungry. Great macro shot of this sandwich, Theadora! Agree with Malou….”tasty” macro shot!! Does Cantal cheese taste like Camerbert or is it stronger, like a Gouda? Mmmmm. Time for lunch! I could use a baguette and fromage right now. My mouth is watering. That cheese sandwich looks simple and delicious. I’ve been to Paris only two times and your photos and descriptions are making me want to go back for a visit very soon!